It occurs to me that, very often, the excitement I feel when looking at photographs that I love is often related to the fact that the photographer has taken a found scene from real life, the real world, and arranged it within a frame in a way that is extremely aesthetically and/or conceptually satisfying. It’s absolutely based upon the fact the the artist tamed the wild world, if only for a moment. I don’t mind digitally-manipulated photography, or staged photography, I’ve seen some beautiful stuff, but ‘straight’ photography can give access to something that they cannot access, that unique perspective of building upon the viewer’s expectation that what they are looking at is from reality, unaltered except for the few choices such a photographer has at his disposal, chief among them the positioning of the camera, the framing of the image, etc. In other arts we presume that the image comes primarily from fantasy, from the imagination of the artist (or at least we’re acutely aware that it may be the case). Even if the source of the painter’s image was indeed a photograph or a vivid scene in front of which he set up his easel, the process of that artist creating the painting is one where I think we inherently accept his freedom to alter or add details as he sees fit. We don’t by default presume an absolute fidelity to reality, even in the most realistic of paintings. The ‘straight’ photographer takes a real-world scene and uses a camera to produce a remarkably detailed facsimile (more detailed than we could possibly hope to take in ourselves, standing there in the moment). He makes a two-dimensional reproduction of whatever his camera is directed toward, often taking advantage of the qualities peculiar to the camera and lens to highlight relationships between objects that, in real life, had no relationship to speak of, other than being visible within the same field of view. I suppose that the photo has to “look” like straight photography, too. There are certain expectations on the part of the viewer that have to be met (or cannot be violated) in order to avoid jeopardizing their bias toward presuming the photo they are looking at is a slice of the real world and reproduces “real” events, things that actually existed at the moment the photographer tripped the shutter. (Of course, most of us are aware, I think, just how much the camera lies, but I’m speaking about the belief on the viewer’s part that the elements of any given photograph actually existed in front of the photographer when he made the exposure, in the placements and configurations as depicted in the final image; nothing has been added from another scene in post-production, nothing removed with a cloning tool). There’s a point where abstraction in a straight photograph becomes too great, even if the resultant photograph is entirely of the real world, wholly unaltered, where the connection to reality is lost to the viewer nonetheless (and for me, the impact of the photograph is then lessened significantly. Or, at least, it appeals to me in entirely different ways. My observation being that it has lost the potential to access the added appeal that a photo that still retains a connection to reality has for me). So “straight” photography gives the photographer unique access to this playground, and there are then ideas available to him/her which they can invoke, can play with, that could only ever work in the way that they do because of the implicit understanding and reliance upon the viewer’s acceptance of the “reality” of the scene depicted in the photo. Making a painting that depicts a cloud hovering ethereally above a street sign is perhaps still a clever and evocative image, but it can’t have access to the added layer of the photographer having been there in the real world and equipped (both in terms of having a camera in hand and artistic vision) to make such a picture at that exact moment in the history of the world, with a healthy dose of humour, playfulness, and wonder. There’s an admiration for the scene as captured, and for the vision of the artist. The thoughts above are while looking at Friedlander’s Knoxville, Tennessee, 1971 photo. This is a truly sublime photo in my view, one of many that Friedlander has produced over his long career. He saw (and sees) the wide deep world in a way that allows him to capture an errant cloud far in the distance, and photograph it in direct relationship with a foreground yield sign, while all the other elements and tones of the image are perfectly modulated, perfectly placed. Such a beautifully balanced image based upon a simple, mundane observation and artistic vision; based upon really looking and seeing what is present in the world before his eyes at that precise moment in 1971. I just found myself vividly imagining Friedlander as he takes this photo. Holding his camera to his eye, shifting around, taking a step forward or back, until everything is placed just so, until everything is where it should be. He must have looked odd to anyone who might have witnessed this strange man seemingly taking a photo of the back of a street sign. But this beautiful photo is the result. 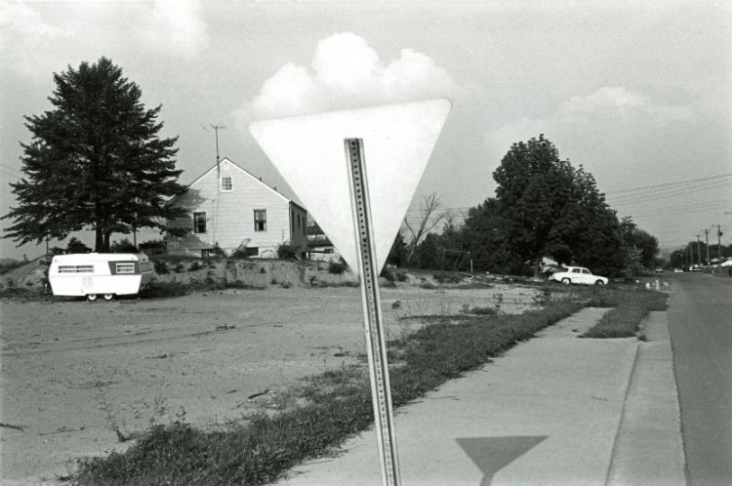 A simple moment in the history of the world (perhaps 1/125 of a second) when Friedlander stopped and snapped a shot of the delightful confluence of a cloud seemingly balanced delicately on a yield sign and then walked on, possibly unaware just how sublime a photo he had just captured until later when he reviewed the negative, or even later than that, when he produced his first print. Anyway, just a few thoughts I wanted to share to the few out there who might be interested. Let us now return to silence.